Discover the interesting history behind Belgrade Plaza, and learn how Coventry’s industrial past made this very modern development what it is today. Belgrade Plaza if full of history, with fascinating anecdotes dating back centuries! Read on to hear about out our interesting past. In an archaeological report taken place in 2004 by Northamptonshire Archaeology, it indicates that the site history dates back to the 15th century. Back then, the Town Wall was built to run along the centre of Bond Street. A ditch existed on the northern side of the Town Wall into which Radford Brook flowed to form a moat. We can still see the Town Wall passing through the site to this day, and to keep this charming part of history part of Belgrade Plaza, we have marked the line of the wall with sandstone in our paved plaza area. See for yourself our boundary of Bond Street up to Upper Wells Street. Fast forward a few centuries, to the 1800’s when the site had turned in to an area filled with housing, gardens, a dye works and a brass and iron factory as well. 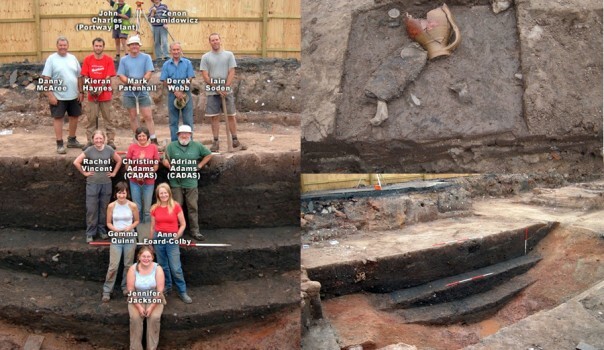 After Northamptonshire Archaeology completed a 17-week dig on the site to record the archaeology of medieval Hill Street and Bond Street before the construction and development programme began, they came across more historical finds. The works uncovered the remains of a 1850s house inhabited by a Mr Jacombs, a silk ribbon-wearer, together with a jug, a pewter spoon and a grand total of 71 shoes which had been surprisingly well preserved! In the 20th century, part of the site had become a bottling store, part brewery and bakery, and replaced some of the farmer houses. This brings us to the 2008 when the Belgrade Plaza development began, initially transforming an old car park and a selection of outdated shops to a brand new hotel with 120 rooms. Making Belgrade Plaza what it is today!